Imagine coming home one day and receiving a surprise parcel from one of the most acclaimed Korean skincare brands and The Butterfly Project Malaysia - just as I was looking for ways to rescue my dry skin! Yessss, water-based skincare are my favourite as they're my skin's saviour when its dehydrated. Since I've heard so many good things about Cremorlab's T.E.N. Water series from friends and seeing this brand at Muse by Watsons, I was so excited to be trying this out! Let's just jump straight into it. First things first, Cremorlab's popular T.E.N. Miracle range, developed by a research team at Tongyang Life Science, combines Thermal water therapy, Eco energy and Natural nourishments to provide the ultimate treatment water for your skin cells. T.E.N. Water, comprised of tiny mineral particles smaller than the pores, are blended with essential natural ingredients like calcium and magnesium, and delivered to the skin in the swiftest and most effective manner. Cremorlab labels this as "miracle blending" to bring the best ingredients in optimal proportions to your skin with this technique. One of their best-sellers is this Mineral Treatment Essence. The Cremorlab Mineral Treatment Essence is a one-step, 5-in-1 total solution essence enriched with T.E.N. mineral properties from natural thermal water and highly compatible fermented components to rapidly restore skin's primal balance. It is free of paraben, fragrance, artificial colouring and denatured alcohol. This essence cares for your pores, whitens, provides intensive moisture by 33%, fights fine lines & wrinkles and improves skin resilience & texture to give you your radiant and firm skin back. I absolutely adore the packaging of the solid glass bottle, the white doodles look so fun and pretty! It's not everyday that you see such a minimalistic yet iconic design on a Korean skincare brand, this really helps to elevate the brand identity. This essence comes in two-box set in silver, one of the boxes containing the cotton pads. As you can see, the Cremorlab Cotton Facial Pad (40 sheets per box) is made of 100% high-quality cotton that does not tear easily because of the stitching at the sides, yet is still silky soft to the touch. It is also highly absorbent. The essence itself is a colourless liquid with a faint, soothing scent that feels very comforting to me. The optimum way to use this essence is by soaking the cotton pad in essence and gently smooth onto the face for 1 minute. After that, turn the cotton pad around and gently pat onto the face & neck for another minute. It is best to apply every morning and night after cleansing and toning. Cremorlab Fresh Water Gel is another one of their top sellers, as it's known for being a light moisturising gel that contains natural botanic minerals and ingredients like seaweed extracts rich in Vitamin A, C, B1 and B2. Other natural ingredients include Bulgarian rose oil, known as the queen of all essential oils. Again, this product is paraben-free and also has a mineral oil-free formula that doesn't stimulate the skin. It deeply hydrates the skin by 63%, soothes & smoothes skin and invigorates your skin's radiance & suppleness by building a layer of moisture protection. While the black & cream packaging again looks simple, it still looks really intriguing with the fun font. Notice that the cap of the moisturiser has the iconic Cremorlab diamond doodles as well. A little spatula comes with the moisturiser too for hygiene purposes. I've tried this moisturiser before as my sister owns it, but I've just only noticed that this isn't one of those water-based moisturisers that turn into water droplets once you rub it in. 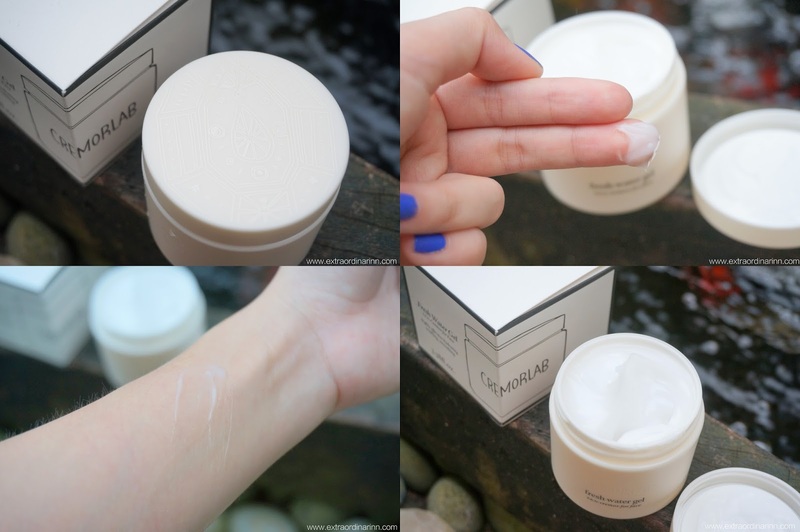 Instead, the gel-like texture is almost thick like a cream, yet still spreads easily and smells fresh & clean. With a higher moisturising content, this moisturiser is absorbed surprisingly fast into the skin. This moisturising gel is supposed to be used after your toner and eye cream every morning and night. I jumped into using these products as soon as I got my hands on them. While I wouldn't say they score very well on the radiance scale after a week of using, it's definitely a dry-skin saviour. Your thirsty skin will definitely drink up the lightweight textured essence and moisturiser and the soothingness kicks in almost instantaneously. However, I find that my skin still looks pretty much the same, just healthier as it's less stimulated now. So, while I'll give a 10/10 score for hydration, I can only give a 7/10 for improvements in skin texture. It's also advisable to only apply a thin layer of the moisturiser in the daytime for people with oily T-zone like me as it tends to get oily around mid-day due to the moisture protection layer that is formed. I believe this will still be my most reached for skincare range for now! - No more dry skin!